MR Balme, MC Curtis-Rouse, S Banham, D Barnes, R Barnes, A Bauer, CC Bedford, JC Bridges, FEG Butcher, P Caballo, A Caldwell, AJ Coates, C Cousins, JM Davis, J Dequaire, P Edwards, P Fawdon, K Furuya, M Gadd, P Get, A Griffiths, PM Grindrod, M Gunn, S Gupta, R Hansen, JK Harris, LJ Hicks, J Holt, B Huber, C Huntly, I Hutchinson, L Jackson, S Kay, S Kyberd, HN Lerman, M McHugh, WJ McMahon, J-P Muller, T Ortner, G Osinski, G Paar, LJ Preston, SP Schwenzer, R Stabbins, Y Tao, C Traxler, S Turner, LG Tyler, S Venn, H Walker, T Wilcox, J Wright, B Yeomans. “The 2016 UK Space Agency Mars Utah Rover Field Investigation (MURFI).” Planetary and Space Science (2018). M Gunn and the PanCam Team. “PanCam Radiometric Calibration.” UKSA-ASB Aurora UK Community Meeting on the 2020 ExoMars Rover Mission, 2018. A Ladegaard, M Gunn and HC Miles. “Automatic radiometric correction of PanCam images.” UKSA-ASB Aurora UK Community Meeting on the 2020 ExoMars Rover Mission, 2018. HC Miles and M Gunn. “Simulating the visual output of PanCam.” UKSA-ASB Aurora UK Community Meeting on the 2020 ExoMars Rover Mission, 2018. EJ Allender, RB Stabbins, M Gunn, CR Cousins, and AJ Coates, “The ExoMars spectral tool (ExoSpec): an image analysis tool for ExoMars 2020 PanCam imagery,” in Image and Signal Processing for Remote Sensing XXIV, vol.10789. International Society for Optics and Photonics, 2018, p. 107890I. G Paar, R Barnes, S Gupta, C Traxler, M Gunn, C Koeberl. “Validation Of The 3D Vision And Visualization Frameworks PRoVIP And PRo3D For The Mars2020 And ExoMars Stereo Panoramic Camera Systems.” Lunar and Planetary Science Conference, 2018. CR Cousins, P Mann, E Cloutis, J Cherry, E Allender, M Fox-Powell, M Gunn. “Basaltic Fluvial and Lacustrine Sediments from Iceland as an Analogue for Mars.” Lunar and Planetary Science Conference, 2018. RB Stabbins, AD Griffiths, AJ Coates, M Gunn, C Huntly, F Trauthan, N Schmitz, and the PanCam Science Team. “Simulating The Image Chain Of The ExoMars 2020 Rover PanCam Wide Angle Cameras.” Lunar and Planetary Science Conference, 2018. EJ Allender, CR Cousins, M Gunn, R Barnes. “Multi-Scale Analysis of Alluvial Sedimentary Outcrops in Utah Using ExoMars 2020 PanCam, ISEM, and CLUPI Emulators.” Lunar and Planetary Science Conference, 2018. CR Cousins, P Mann, E Cloutis, J Cherry, EJ Allender, M Fox-Powell, M Gunn. “Visible-SWIR spectroscopy and alteration mineralogy of fluvial and lacustrine basaltic sediments from Iceland as an analogue for Mars“, BPSC17, 2017. EJ Allender, CR Cousins, M Gunn, AJ Coates. “Scientific Integration of ExoMars Pancam, ISEM, and CLUPI instruments“, BPSC17, 2017. R Barnes, S Gupta, M Gunn, G Paar, C Traxler, T Ortner, A Bauer, K Juhart, B Nauschnegg, L Fritz, G Hesina, J-P Muller, Y Tao. RB Stabbins, AD Griffiths, AJ Coates. “Mars in 3D – 3D geological analysis and terrestrial validation of rover-derived stereo-images for the ExoMars 2020 PanCam“, BPSC17, 2017. M Gunn, DP Langstaff, C Huntly, C Cousins. 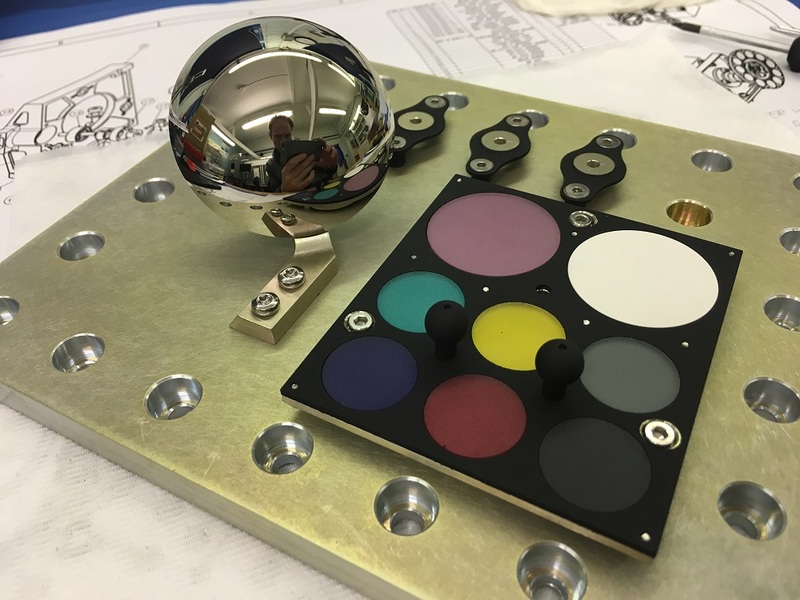 “A Hyperspectral Camera for Planetary Exploration“, BPSC17, 2017. RB Stabbins, AD Griffiths, AJ Coates, M Gunn, C Huntly, and the PanCam Science Team. “End-to-End Simulation of the ExoMars PanCam Wide Angle Cameras“, BPSC17, 2017. RB Stabbins, AD Griffiths, AJ Coates, M Gunn, C Huntly. “Image chain simulation and performance predictions of the Exomars Rover pancam instrument wide angle camera”, RSPSoc2017, 2017. R Barnes, S Gupta, M Gunn, G Paar, M Balme, M van Cappelle, SG Banham, B Huber, A Bauer, C Traxler, G Hesina, T Ortner, J Harris, S Kaye, J-P Muller, Y Tao. “Quantitative analysis of digital outcrop data obtained from stereo-imagery using an emulator for the PanCam camera system for the ExoMars 2020 rover“, National Astronomy Meeting, 2017. R Barnes, S Gupta, M Gunn, G Paar, B Huber, A Bauer, K Furya, MP Caballo-Perucha, C Traxler, G Hesina, T Ortner, J-P Muller, Y Tao, M Balme. “Application of PRo3D to Quantitative Analysis of Stereo-Imagery Collected During the Mars Utah Rover Field Investigation (MURFI) Analogue Rover Trials.” Lunar and Planetary Science Conference, 2017. MR Balme, MC Curtis-Rouse, S Banham, D Barnes, R Barnes, A Bauer, C Bedford, J Bridges, FEG Butcher, P Caballo, A Caldwell, A Coates, C Cousins, J Davis, J Dequaire, P Edwards, P Fawdon, K Furuya, M Gadd, P Get, A Griffiths, PM Grindrod, M Gunn, S Gupta, R Hansen, JK Harris, J Holt, B Huber, C Huntly, I Hutchinson, L Jackson, S Kay, S Kyberd, HN Lerman, M McHugh, W McMahon, J-P Muller, G Paar, LJ Preston, S Schwenzer, R Stabbins, Y Tao, C Traxler, S Turner, LG Tyler, S Venn, H Walker, J Wright, B Yeomans. “UK Space Agency ‘Mars Utah Rover Field Investigation 2016′(MURFI 2016): overview of mission, aims and progress.” Lunar and Planetary Science Conference, 2017. AJ Coates, R Jaumann, N Schmitz, CE Leff, J-L Josset, AD Griffiths, G Paar, BK Hancock, D Barnes, LG Tyler, M Gunn, A Bauer, CR Cousins, F Trauthan, H Michaelis, H Mosebach, S Gutruf, A Koncz, B Pforte, J Kachlicki, R Terzer and the ExoMars PanCam team “PanCam on the ExoMars 2018 Rover: A Stereo, Multispectral and High-Resolution Camera System to Investigate the Surface of Mars. Lunar and Planetary Science Conference, 2015. M Gunn, “Spectral imaging for Mars exploration” (2014). CR Cousins, M Gunn, BJ Prosser, D Barnes, IA Crawford, AD Griffiths, LE Davis, AJ Coates. “Selecting the geology filter wavelengths for the ExoMars Panoramic Camera instrument.” Planetary and Space Science 71.1 (2012): 80-100. D Barnes, MC Wilding, M Gunn, SM Pugh, LG Tyler, AJ Coates, AD Griffiths, CR Cousins, N Schmitz, A Bauer, G Paar. “Multi-Spectral vision processing for the ExoMars 2018 mission.” ASTRA 12 (2011): 1. M Gunn, D Barnes, CR Cousins, DP Langstaff, LG Tyler, SM Pugh, D Pullan, AD Griffiths. “A method of extending the capabilities of multispectral interference-filter cameras for planetary exploration and similar applications.” Hyperspectral Imaging Conference, 2011.